So in this age of food photography and Instagram (#nomnomnom), I did what would be considered a massive â€œInfluencer Faux Pasâ€� (but should win me points for being a real human being) I was actually enjoying the company, the wine, and the food so much that I actually FORGOT to take pictures of it all ðŸ¤¦â€�â™€ï¸� (And I donâ€™t even feel bad about it). Plus forgetting to take pictures of my food had me messaging the Executive Chef over Instagram and asking to use his pictures, which are WAYY more appetizing than any food selfie I could snap with my phone. So without further adieu, here is what we ate! Yellowfin Tuna Tartare; ponzu aioli, puffed rice, avocado purÃ©e, smoked pineapple, pickled cipollini onion,dill pickle chips. Beamsville Muscovy Duck Breast; lingonberry, celeriac, farro, sour cherry + foie gras jÃºs. Wild Boar Ragu is 100% my favourite thing. EVER. Itâ€™s literally the reason I visit Noble, and sometimes I do think I should extend my choices and try something different. BUT I JUST LOVE IT, and Iâ€™m not against stealing a bite off a friends plate to try their food (I am THAT girlðŸ™Œ). It is also a very big treat since I hardly ever eat pasta and the Orecchiette is perfect. (Both locations have a wild boar pasta, but the type of pasta sometimes changes). The duck wasnâ€™t my dinner, but was eaten by a self proclaimed â€œDuck Connoisseurâ€�, who has apparently eaten duck all over the world, in every way you can possibly eat a duck, and he couldnâ€™t say enough good things about it! And being the type of person who steals bites of food off peoples plates, I have to agree that it was a pretty perfect duck. The other really great thing about it, was how helpful our server was. He knew absolutely everything about the menu, could explain the details of the pineapple that was smoked in house for the Tuna Tartare, and was just all around friendly and helpful (which yes, that is his job, but he does it well). Not Pictured: The loaf of â€œstraight from the ovenâ€� bread drizzled with olive oil and herbs. And the Pecan Pie Tart with warm crÃ¨me anglaise, vanilla ice cream and bourbon white chocolate crumble (which was also super delicious). 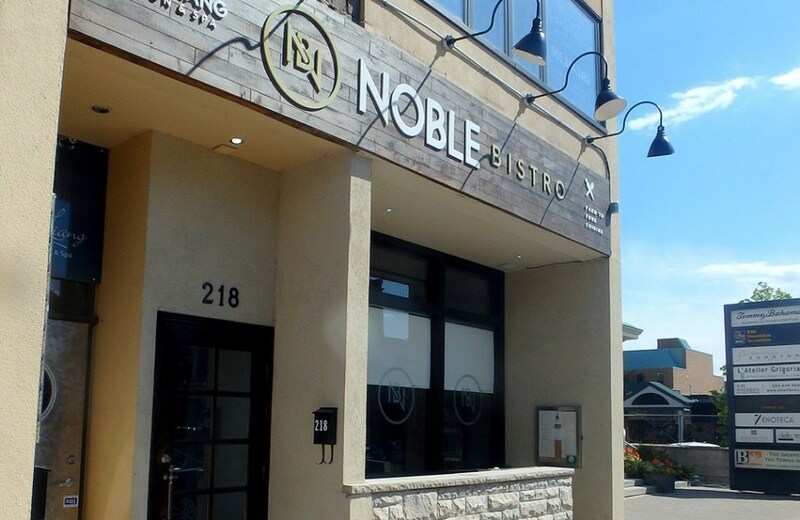 If you are ever wandering Downtown Oakville and you start feeling like you could really use a glass of wine and an even better meal, definitely stop in at Noble Bistro. Bring a friend, drink the wine, try the duck, demolish a plate of wild boar ragu, and at least a few bites of dessertðŸ˜‰ and I swear youâ€™ll end up having a pretty perfect evening.